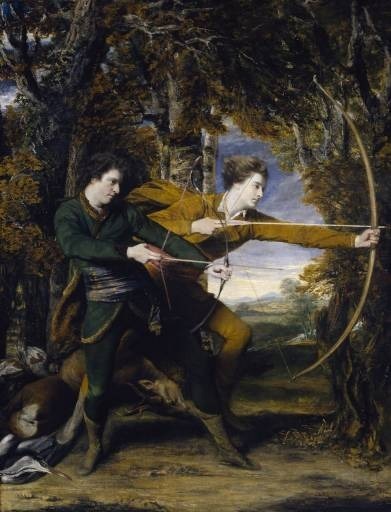 Sir Joshua Reynolds' turbulent mythological masterpiece is a swirl of volatility, depicting an action-packed scene. The story is derived from the classical Roman myth, originally stemming from Greek mythology. Hercules' character had been adapted as it went through Roman culture and even early Germanic culture as well. 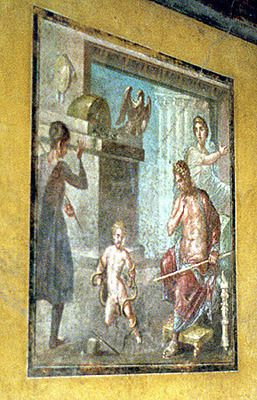 In this specific scene, Reynolds painted Hercules as a baby in his cradle fighting off the two snakes sent by Hera, Zeus' wife who was jealous of the infant. Zeus had proven himself unfaithful numerous times unto Hera and she decided to take her revenge by killing his latest illegitimate child by the mortal Queen Alcmena. She sent two serpents to the sleeping baby, but the event only showed the child's earliest traces of heroic power. Hera did not stop there to get her vengeance on the boy, especially as Hercules' mother named him after Hera, a name meaning "Gift of the Goddess Hera". After he had grown up and had a family, Hera stirred such furious emotion in Hercules that he murdered his wife, Megara, and their two children. Realizing what he had done, he went to Apollo, the God of the sun and prophecy, and there he was given 12 labors. But seeing as Hercules was a demi-God and a good person, he was to be immortal and live with the Gods when he left earth. The subject matter of this work is taken from mythology, of a theme that was visited and revisited in ancient Greece and Rome, that of the Gods and Hercules in a delicate interplay. Reynolds also drew a great deal of inspiration from the Baroque era and its aesthetics as he, too, experimented with various ways of creating and mixing paints. 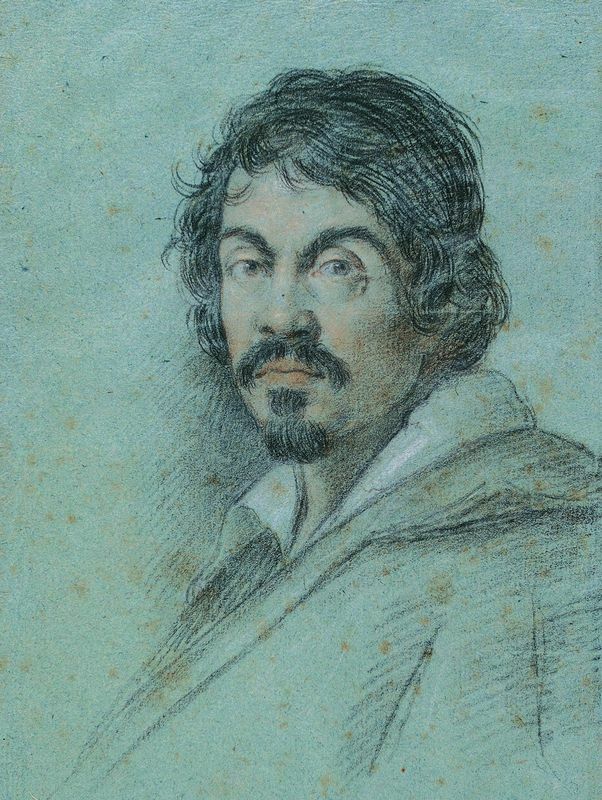 He relied a great deal on the chiaroscuro techniques of both Rembrandt and Caravaggio and analyzed the different lighting approaches to create mood and composition, which are particularly evident in The Infant Hercules Strangling Serpents in his Cradle. Reynolds uses various painting techniques in this work to portray bodily movement, dramatic clouds and fabrics. This painting shows in its technique Reynolds' maturity, as he became more experimental at this stage in his career, adopting different color mixing techniques and creating new tones to accentuate the work. The viewing process takes on a circular motion, as we are directed constantly to the infant in the center. Reynolds uses black and grey and with various aspects of darker brown to create the deepening shadow for the dimension and drama of the scene as he uses chiaroscuro extensively in this work. Stark white is utilized when he looks to create clear outlines for the characters in the busy scene as well as creating visual harmony in the work. Yellow is the primary color and works to harmonize the colors to reassert the golden presence of the baby. Much of the painting's dimension and depth is created by Reynolds' vigorous use of chiaroscuro. The play between light and shadow is very intricate, and the artist has achieved a perfect harmony with every aspect in proportion to another, without jeopardizing the spatial planes in the overcrowded image. Two light sources are created; the first emanates from the top right hand corner behind the viewer that falls directly upon the infant Hercules, while a second light source streams in from the same direction, however farther into the image. 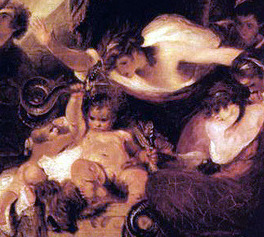 In the center of the composition, for the ornamental crib and for the baby, as well as the hair and accessories of the surrounding characters, there is great attention to detail as Reynolds' used a fine brush. He smoothly applies various different colors and tones above the first layers so it does not set too thickly upon the canvas. Reynolds uses broader and bolder strokes for the ominous clouds to the top of the work, and lets the paint thin on the canvas to convey the dissipating ends of the clouds that created a more menacing effect. Mythological subject matter has been fodder for artists throughout the ages, particularly ancient Greece and Rome. 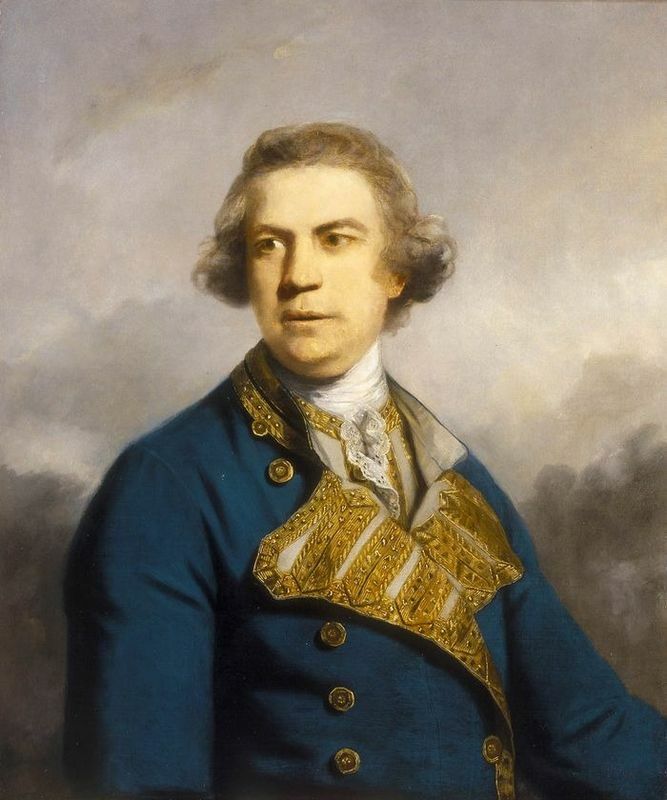 Hercules, with his acts of bravery and heroism, is a favorite of artists, both before and after Sir Joshua Reynolds tackled the tale with such devastatingly dramatic results. 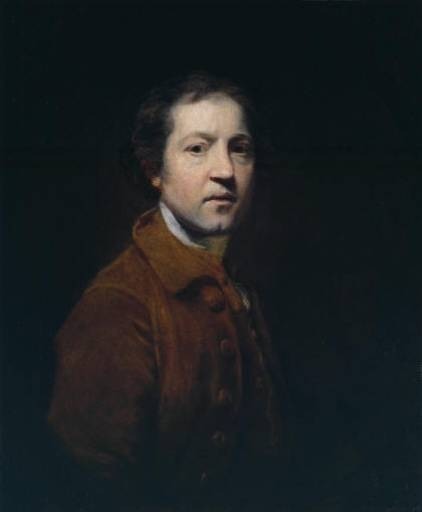 A man of great consequence and influence during his own time, the work of Sir Joshua Reynolds has been hotly debated by subsequent artists who wished for a less formulaic, more spirited type of art. What is undeniable is that his legacy continues to this day, though criticized to varying degrees throughout history. Reynolds went on to found the Royal Academy of Arts and was later elected President. 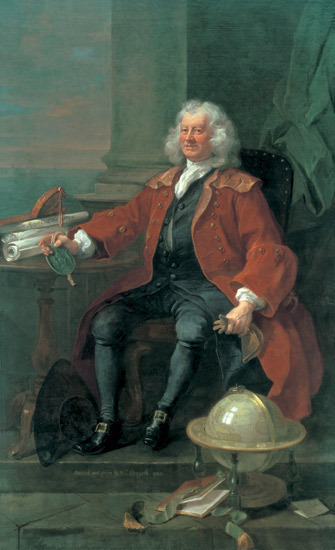 He gave a series of successful lectures that were taken as quite perceptive for their time. Works such as The Infant Hercules Strangling Serpents in his Cradle have cemented his place in history amongst the critics of his own time, up to modern times as well. Reynolds fused the styles of the Italian Renaissance and the fashions of his time to forge a new and extravagant painting style that took Europe by storm. His biggest inspiration came from his time spent in Italy where he noted all the great masters and learned about their compositional, chiaroscuro and coloring technicalities. Such knowledge impacted on his artistic career for the rest of his life. Reynolds completed over 3000 works of art, including a few preliminary sketches which were very rare as he wasn't a keen draughtsman. He' worked every hour he could, including Sundays, from morning to night. Even after his mild stroke and the deterioration of the sight in his left eye, he endeavored to discover new dimensions to the art of painting. Painting was his passion, until the end of his career and life and because of this he has been dubbed the father of British painting.